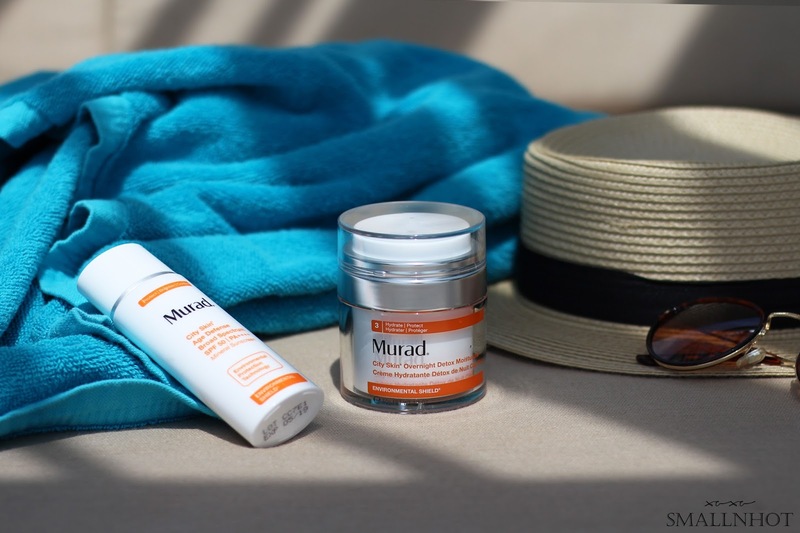 Murad's City Skin Age Defense SPF & Overnight Detox Moisturizer - Do they work ? Murad City Skin Age Defense Broad Spectrum SPF 50 PA++++ is a revolutionary, ultra-light 100% mineral broad spectrum PA++++ and SPF 50 sunscreen with Environmental Protection Technology shields skin from main causes of damage that accelerate signs of aging which includes Blue Light from devices, pollution, infrared radiation, UVA and UVB. You'll LIKE the lightweight and barely there kinda finish. You'll HATE it because the scent and finish might resemble slightly of a Banana Boat-like sunblock. For daytime, I've been topping my routine off with the Murad City Skin Age Defense Broad Spectrum SPF 50 PA++++. 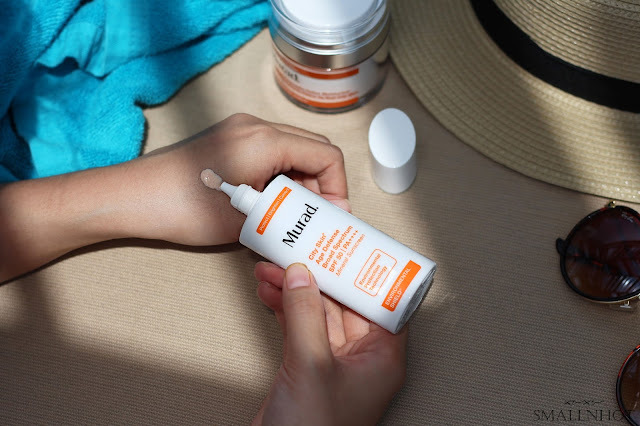 It has a very lightweight, peachy color formula that brightens things up, providing a slight tint of coverage and SPF 50. Aside from that, it feels hydrating on the skin but if you go slightly overboard with the application, it can get slightly greasy which resembles the "Banana Boat"-like sunblock finish. Fragrance-wise, it claims to be fragrance free but I can get a hint of "Banana Boat"-like scent from it, just a teeny-weeny hint. Other than protecting you against environmental aggressors, it also contains ingredients like Lutein and Iron Oxides which enhance the broad spectrum protection, defense against blue light from all the electrical devices and infrared radiation. And that is why this is currently living on my skincare shelf. I am not sure whether it's me or what, the days where I slather this on, I notice my face tends to be less dull after a whole day of work, looking into the computer and mobile phone. 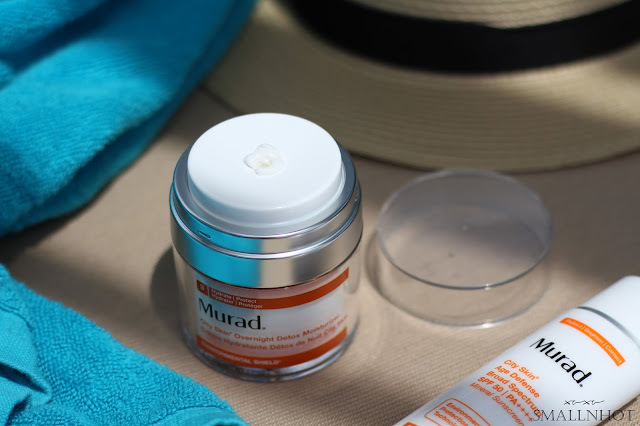 Anyway, the Murad City Skin Age Defense Broad Spectrum SPF 50 PA++++ did checked all my sunscreen boxes, it is lightweight, slight coverage, SPF 50 PA++++, broad spectrum protection, and even defense against blue light, so what's not to love ? Murad City Skin Overnight Detox Moisturizer detoxifies and revitalizes skin overnight. The formula contains super-charged antioxidants from Marrubium Plant Stem Cells, neutralizes pollutants and strengthens skin's barrier while you sleep. Generation Vitamin C helps brighten and even tone, while nourishing botanicals plump skin to help visibly reduce fine lines and wrinkles. You'll LIKE how your skin feels the next day after using this. You'll HATE the tingly sensation that comes along if you have sensitive skin. This might not be the cheapest overnight moisturizer but it actually the best we have tried so far. This overnight detox moisturizer has a lightweight creamy formula and a light layer is all you need to feel the benefits, or in other words, one pump and it will dispense the necessary amount for application. The directions say to massage on but to be honest, it absorbs into the skin really quickly, felt more like a moisturizer than an overnight moisturizer, but that doesn't make it any less effective tho. My skin always feels so vibrant and plumped up the morning after. I'll grab for it whenever I have had put on a tonne of makeup for an event, making it like my post-heavy makeup moisturizer in order to hydrate and rejuvenate my skin from dehydration and dullness. As I have mentioned, this is not the cheapest overnight moisturizer but I can see myself stocking up this once it's finish. Just a side note, if you have sensitive skin, you might feel a slight tingly sensation as you apply. I think it's because of the concentrated Vitamin C content in the product. However, for my case, it settles down within a few seconds so if the tingly sensation persist, perhaps you need to consult your dermatologist.